Francie Collins March 1, 2019	 April 1, 2019 New To Tiny Homes? Living on a tiny house is a lifestyle and one of the first steps that you have to do is to pare down. Although you should definitely stick to the basics, that doesn’t mean you’d have to say goodbye to your hobbies. You can still bring along some hooks, needles and yarn for your crafting, some paintbrushes and paint for your artworks, musical instruments or just about anything you have passion for. The key here is to make sure you have a place to store them. Small as it may seem, a tiny house can still hold a lot. You just need to be creative about your storage spaces. Here are a few useful ideas that you can use for your tiny home and your not-so-tiny home as well. Reclaim the space that your bed takes during the day so you can better accommodate guests, make room for kids to play or have a better office space. Murphy beds are the perfect solution. They come in varying sizes and they can be easily customized to fit the surrounding cabinetry. We’ve all heard about the storage ottomans but why stop there when you can also have other furniture with hidden storage. Your sofa, a built-in bench, and even your bed can all be storage areas. Due to a limited square footage, you may think that you don’t have enough space for storage. The answer is to look up, all the way up. You can create cabinets and storage areas as high as you can reach. You may even build higher cabinets for seasonal items or those you don’t use all the time. A handy and creative ladder that you can pull out and hide in plain sight can help you reach them when you need to. A built-in loft-like bed area above your cabinets can make the tiny home feel more cozy while saving some precious space too. Lofts can also be just above your living room or bathroom. It lets you use all vertical space available in a creative way. Your storage space shouldn’t only be limited to the indoors, there is also a lot of room outdoors. A storage area near the main door is a great spot for umbrellas, coats and boots. You can even have an outdoor storage for your gardening tools. If you’d like to know more about gardening the tiny house way, you should definitely read the Tiny Home Gardening post. 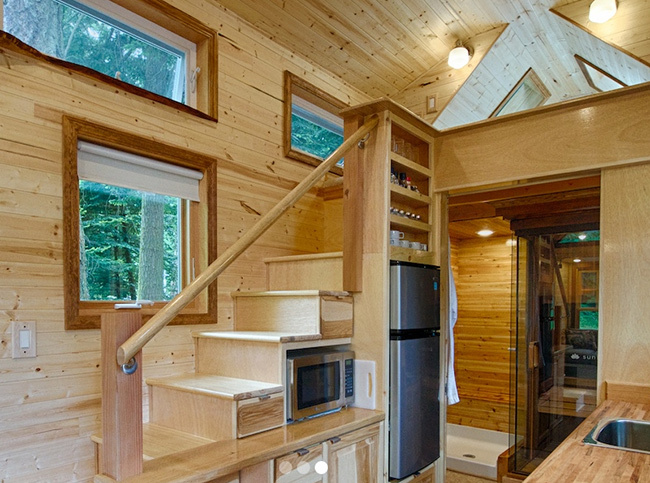 In most tiny houses, the staircase doesn’t just help you go up or down. It is also a convenient storage space for various small items like books, socks, tools, toys, and many others. You can even organize your items and put one kind in each step. A pegboard storage is a great way to store your items and put them in display at the same time. Use it in the kitchen area for your pots, pans, or cooking utensils. Use it for your crafting materials, tools, accessories, bathroom supplies and many others. These 7 storage ideas will definitely help you better plan your tiny home or add more storage space to your current home. Do you use any of them in your home? Tell me all about it below in the comments section. What’s The Future of Micro Apartments in USA?